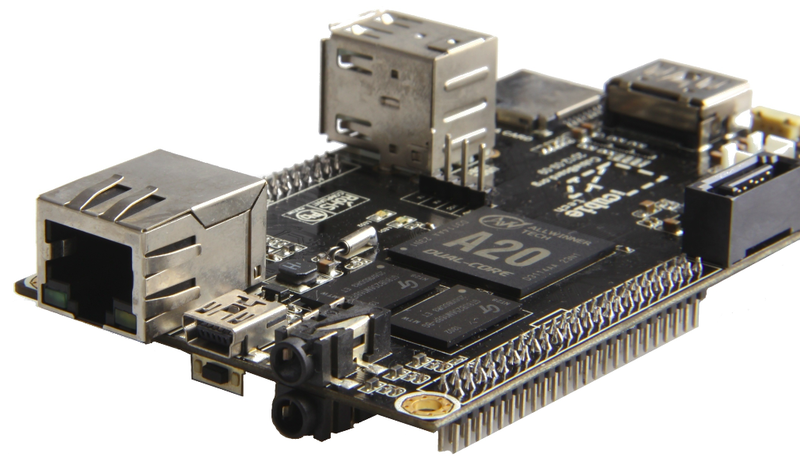 Received the BeagleBone Black (BBB) and the MK808 with a RK3066 SoC. My first impressions are really positive. Especially the BBB is quite an awesome device that I’m probably going to use a lot in favor of the Raspberry Pi. At first glance I had something like, the BBB blows the RPi away, but as soon as I started looking for documentation on how to put Debian on it for instance it became clear that the RPi is still the device to beat. The RPi community is huge, documentation for it is well laid out and working with the RPi is just so easy. The BBB on the other hand lacks a vivid community, is $10 more expensive and a lot more difficult to work with. Take the Debian install for example, seems quite some work to get that going. The MK808 is surely an improvement over the UG80X I already own. It comes with a HDMI port instead of a HDMI plug, has an extra USB OTG port, a heatsink, hardware serial console access, a reset button and a power indicator LED. The pre-installed Android version looks better too. I flashed my RT kernel recovery image on it, inserted the Micro SD from my UG80X and it booted without any issues. So I’m going to pursue my goal to get a real-time, low-latency environment running on a RK3066 based device on the MK808 and find another purpose for the UG80X. Next time I’ll promise to make better use of my Google skills.